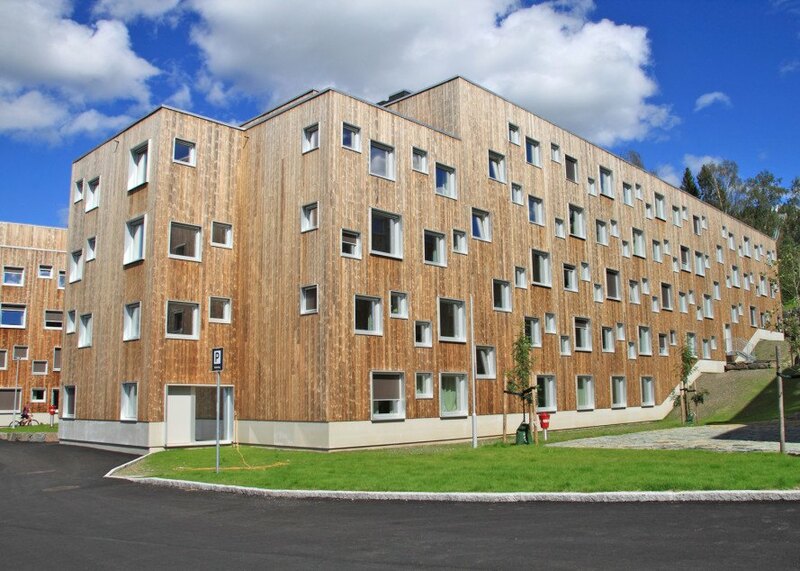 Students attending the upcoming 2016 Youth Olympic Games in Norway will be accommodated in four blocks designed in line with the passivhaus principles. The buildings are beautifully clad in durable wood and able to resist the harsh winter weather of the Gudbrandsdal region. 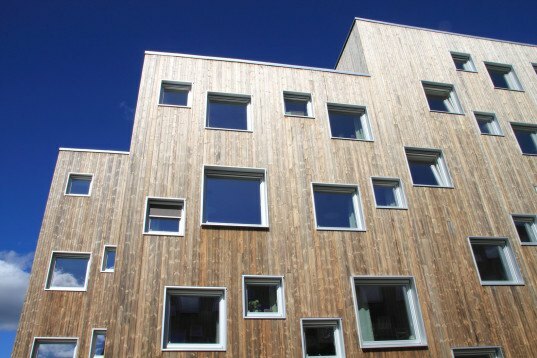 Henning Larsen Architects and SGB designed the student housing named SOPP (short for Studentsamskipnaden i Oppland) and enveloped it in Kebony, which is an environmentally friendly softwood produced in Norway. The uniformly-clad buildings are punctured with the windows of the 360 apartments, which will be accupied by around 1,100 young athletes from 70 nations. The athletes will gather for 10 days to compete in 15 traditional winter disciplines. The 18.2-square-meter and 18.4-square-meter flats amount to a total floor area of around 13,000 square meters. Each unit contains an en suite bathroom and kitchenette, and has acess to a shared social room. Sustainability was the main goal during the design process, resulting in a project that meets the passive house requirements, with minimized energy consumption and sustainable materials. A new heating plant will produce all of the heat needed for internal heating and hot water. Due to the harsh weather, the architects decided to use a more resilient type of cladding which wouldn’t deteriorate over time. In addition to its durability, Kebony softwood has many environmental benefits: it has no harmful effects on the environment and requires almost no maintenance. The uniformly clad buildings are punctured with windows of the 360 apartments, which will be accupied by around 1,100 young athletes from 70 nations for 10 days competing in 15 traditional winter disciplines. The 18.2-square-meter and 18.4-square-meter flats amount to a total floor area of around 13,000 square meters. Each unit contains an en suite bathroom and kitchenette, and has acess to a shared social room. Sustainability was the main goal during the design process, resulting in a project that meets the passive house requirements, with minimized energy consumption and sustainable materials. A new heating plant will produce all of the heat needed for internal heating and hot water. Due to the harsh weather, the architects decided to use a more resilient type of cladding which wouldn't deteriorate over time.